I've been wanting to do a sparkly version of my ombre mani and last week, I finally sat down and did it! Behold: the glittery gradient manicure! Want to do your own glittery gradient mani? Here's how you can recreate this look. You'll want to gather three bottles of polish in various shades of the same color; one lighter, one darker, and one glittery! For long-lasting results, you'll want to grab your trusty bottle of top coat as well. 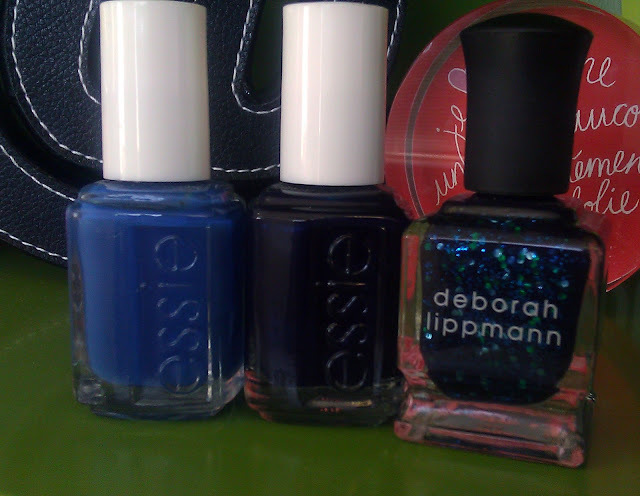 I used Essie Mesmerize, Essie Midnight Cami, Deborah Lippman Across the Universe, and Seche Vite Dry Fast Top Coat (not pictured). Start of by polishing your nails with one coat of the lightest color. Let it completely dry. Take the darker color and polish just the tip of each nail, like you would for a french manicure. Let dry. Swipe the glitter polish onto each nail starting from the middle of the nail and going all the way to the tip. Once that coat is dry, add another coat starting 3/4 of the way from the base of your nail and sweep all the way to the tip. Your nails should now be light at the moon and dark at the tip. 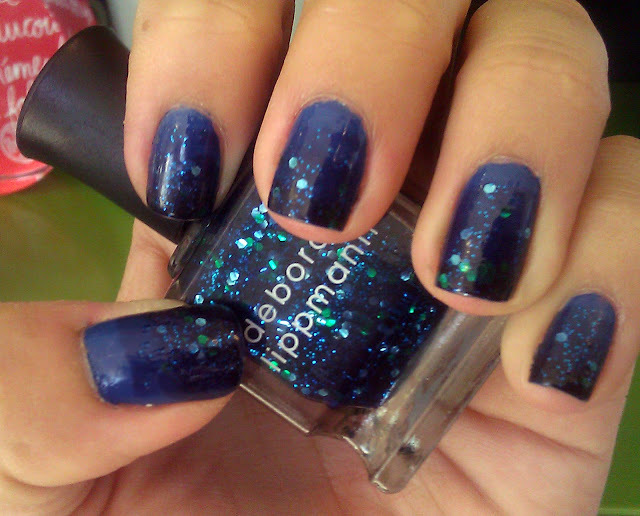 If desired, you can dab one last bit of glittery polish on the tip of the nail, in the same manner in step three. Seal it all up with a good top coat! Please share your own glittery gradient manis by emailing photos or a link to your post to triplyksis [at] gmail [dot] com. I would love to see them as well as feature them on my blog! Happy polishing!